I volunteered to make a casserole to feed a family of four, which had to pass a great deal of criteria. The day I promised to deliver, my schedule was booked, therefore said dish must be made a day in advance, baked off the following evening, and delivered hot at supper-time. It had to be a complete meal in one dish — protein, starch and vegetables — and satisfy palates that preferred spicy to run-of-the-mill, yet it must also be teenage,fast-food-palate friendly. Not done yet. This dish must be no-bones hassle and scoopable — lap-friendly, if required. I also wanted a colorful, festive plate, with enough food so there would be leftovers the next day for the microwave. You’d think I’d have the perfect recipe up my sleeve. In fact, I did not. It’s clear there’s a deficit in my arsenal, so I developed the following, deciding a Tex-Mex chicken dish would be perfect. To me, Tex-Mex implies food that’s not authentic to Mexican traditional cooking, but certainly more authentic than what you’d receive at a talking chihuahua chain. And — vegetarians aside — who can take issue with skinless, boneless chicken breasts? I had some ideas. Since air-chilled chickens don’t depend on ice-water for chilling, they don’t absorb so much excess water, which may contain chlorine. As well, the chicken is juicier and more tender.To my palate, air-chilled chicken, especially the breasts, provide the best eating experience. The pre-spiced canned tomatoes are a work horse in the recipe. 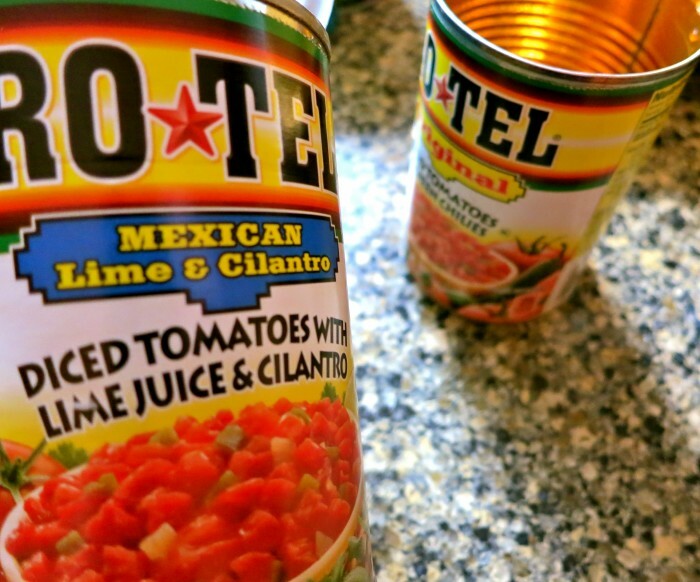 I used two cans of Rotel, one with jalapeno and the other spiked with lime. Check out the Latin section of local groceries and let your palate be your guide.You may certainly use unadulterated diced tomatoes, but the rice will need additional punch; instinct is required to add your signature. Don’t let the lengthy directions throw you off; it’s not difficult to make. Keep in mind the hoops this casserole had to jump through to please. Rinse rice well. In a pot, bring tomatoes and chicken stock to a boil. Stir in rice, then reduce to a simmer and cover. Cook until rice has absorbed most of the liquid and is just tender, about 20-30 minutes depending on rice. Add additional stock to pot is rice is hard and stock is depleted. When cooked, remove from heat, stir in garlic, 1 tablespoon seasoning, 3 tablespoons cilantro and season with kosher salt, if needed. Let sit, covered, until ready to assemble with chicken and vegetables. While rice is cooking, in a large sauté pan, heat one of the tablespoons oil over medium high heat. Add bell peppers, poblano and jalapeno and cook, stirring, 3 minutes. Remove from pan, stir in corn kernels, season with kosher salt if needed, and reserve. Lightly season chicken breasts with kosher salt and rub 1 tablespoon Mexican seasoning blend into both sided of the chicken breasts. In the same pan you cooked the peppers, add remaining 2 tablespoons oil and heat over medium-high heat. Sear breasts 3 minutes per side, or until golden brown. (The meat should be just just white with a hint of pink at the center.) Remove from pan and when cool enough to handle, slice diagonally into 1-inch pieces. 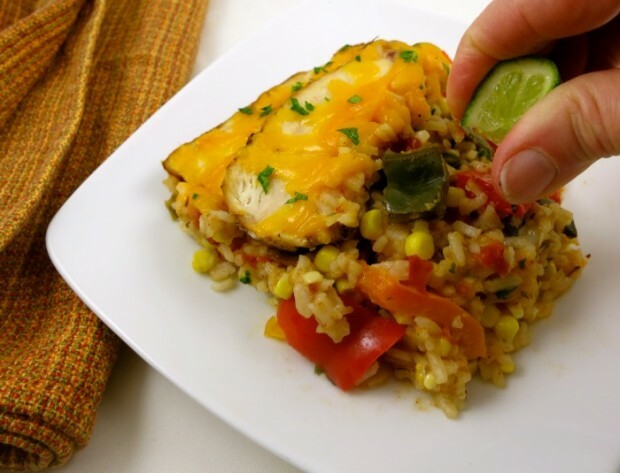 When ready to assemble, stir pepper mixture into rice and place in an 8×12-inch baking dish. Arrange chicken pieces over rice, tucking them halfway into rice. Evenly sprinkle 1 cup cheese over casserole, adding more if desired. Cover with non-stick foil or oil that has been lightly oiled. (Casserole may be refrigerated up to 24 hours at this point.) Bake on center rack of oven 25 minutes. 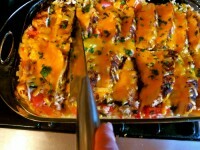 Remove foil and bake an additional 5-10 minutes, or until cheese is melted. Sprinkle with remaining tablespoon cilantro and serve with lime wedges, if using. 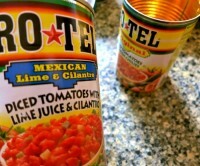 *Powdered cumin, chili powder or any combination of Southwest seasonings fine; I used Morton & Bassett Mexican Blend. Sounds perfect for the group “Mexican flair” dinner we’re just starting to put together. However, did I miss the cheese somewhere? I am assuming plain old Cheddar would be fine-about 2 cups? Also…is there any way I can have access to other readers’ comments? I really miss that! Thanks for your wonderful recipes. For me, they work and are delicious. Other sites, not so much! Where in Ann Arbor can I buy air-chilled chicken? In Ann Arbor you can buy the Bell & Evans brand at Hillers, also they carry air-chilled chicken at Hillers. I’m sure I’m missing other stores but that is where I’ve purchased them lately. If you see them elsewhere, please advise. Thanks, Gloria! The only air-cooled chicken that I’ve found is “Smart Chicken” but if you ask the butcher in your preferred grocery store, they probably have completely totally fresh and organic chicken breasts. You probably have to pay alot more and I do mean alot more: at least double the price of the standard boneless, skinless chicken breasts in the store when they are on sale. Keep in mind that the price reflects the price of oil, price of feed (which also has a cost of oil), and the butchering of the chicken (and then the cost of oil for delivering it to the grocery store). I’ve asked the butcher in my local Cub store for fresh chicken breasts because I’m single – happily divorced actually (30 years now) and cut my poultry and meat products into single servings before I put them in my deep freeze. Usually, he gives me the same price as the chicken breasts that are on sale. But I’m a regular weekly customer too.